Of course there were going to be exquisitely-detailed giant origami birds! 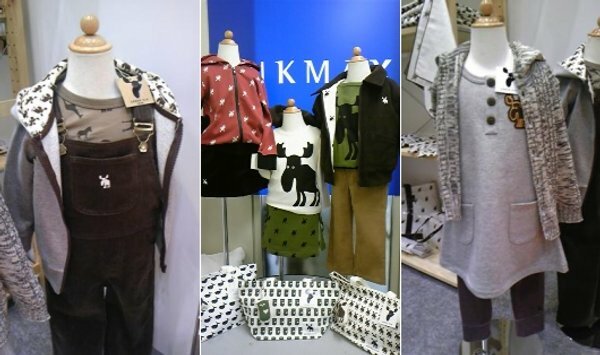 What an amazing display at Playtime Tokyo’s fashion-focused children’s trade event for 2010. 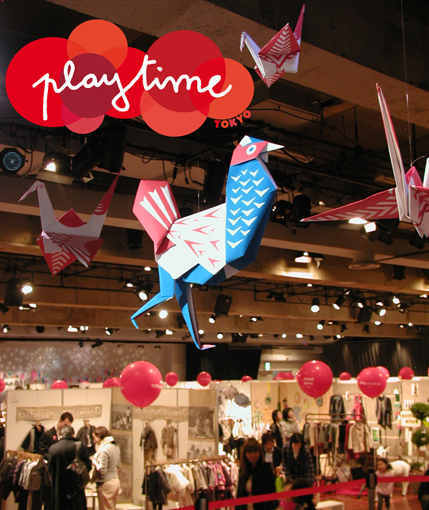 We brought you some awesome brand finds from Playtime Paris and now it’s Tokyo’s turn. We just love that many of the brands are some we’d have difficulty bringing to you if it weren’t for this fantastic trade show. Most of the websites are in other languages but the images really speak for the products. Have a look at our faves! Sweet Lala Dress, how I do love your name. Nothing like singing ‘Lalala’ to transport you to a less complicated time and in this case, an impeccably-styled one. Plain but frilly – it must take some kind of genius to perfect that kind of design. Wow. Just wow. 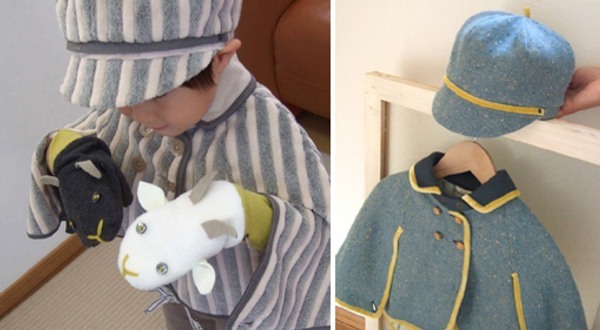 Kubomi combines child-like charm and humour with what looks like beautifully turned out woollen felt. Little boys can wear capelets too! 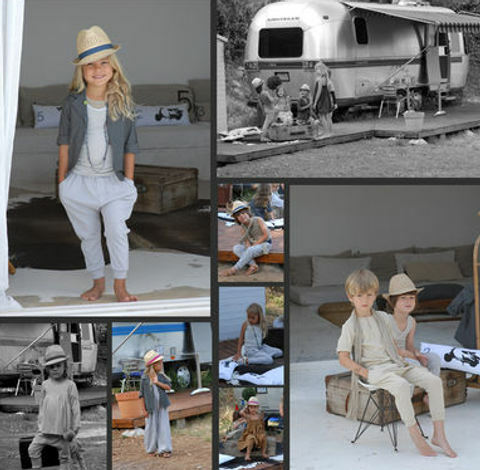 L’ Esprit de Luna deliver floaty, neutral garments for both boys and girls which look comfy and cool to boot. I just challenge you to remain stony-faced with that gorgeous little boy in the cap staring out at you. 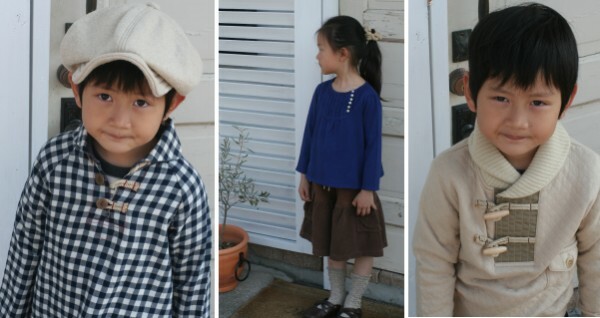 The picks for boys are really leaping out at me from Tokyo and Tappet tops my list. Yo Happy makes me happy with its culinary-inspired goods. 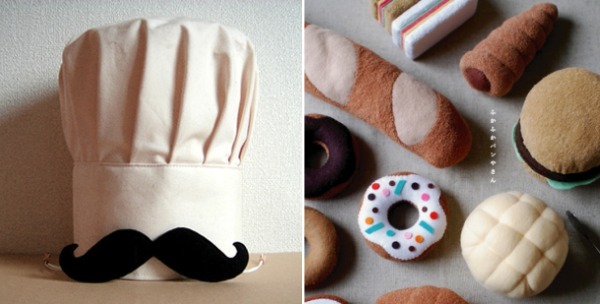 A chef hat with a moustache and perfect little cakes made from high quality fleece make me want to raid Bread Top right this very moment. Yo Happy also makes cute portable blackboards cut into shapes of suitcases, guitars, ping-pong paddles and buckets. Give me one of every outfit you see on this fabulous Maarook video. I just can’t fault the lineup, with amazing urban looks for girls, boys and babies. These are my dream outfits! Smart and oversized for boys and clean-cut preppy for girls. Absolutely stunning clothes, Schuss cater for babies, toddlers and children up to sixteen years. Who doesn’t love a bit of an elk theme in winter? For us in Australia, it’s a bit exotic and brings back fond Northern Exposure memories. Urban Elk produces gorgeous clothes and accessories for children and even has a vaguely navigable site for speakers of English! This video of a demonstration of the Urban Elk pram snug is absolutely unmissable. The cute factor is sky-high… and I do wonder what kind of pram they’re using. We hope you loved reading this roundup as much as I loved making it.